Campers make incredible strides in their swimming at Miquon. 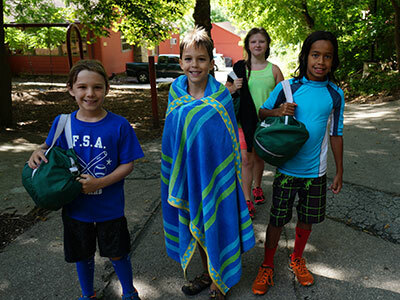 Every camper has not one but two swimming sessions a day — a 30 minute swimming instruction supervised by certified water safety instructors, and a second 30-minute recreational swim in the afternoon. Campers take lessons in small groups (and often, one on one instruction) that emphasize building confidence and comfort in the water first. Once the confidence is achieved, then instructors move to work onto swimming skills. Children are grouped according to current swimming comfort/achievement levels following proficiency standards based on the American Red Cross.